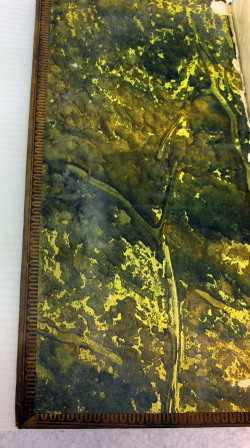 I had the great and good fortune to be vacuuming mold out of this account book today. 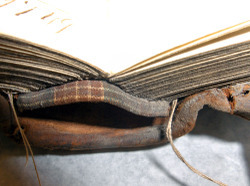 It's your standard mid-19th Century sheepskin account book---nothing special. 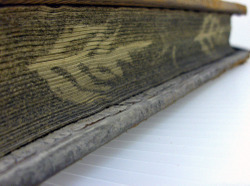 It suffers from serious red rot, but the paper's good, the spine's strong and structurally it's still a champ. What kept me breathing deep was the piling on of seemingly gratuitous appointments. 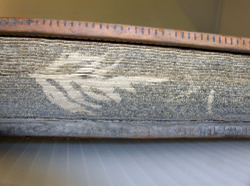 For example; the masked leaf motif along the sprinkled edges---and given the natural variety of each mask, I think these were made by pasting the tops of whatever was growing outside the bindery door onto the side of the book and getting on with the sprinkling. And then there's this; a plaid end band. What the hell. Who was working at this shop? Every other book in pile had the same sheepskin, the same stamped covers and board edges, the same lines and columns on the inside. And all of them have the same nasty ticking fabric on the end bands. This one's got plaid end bands. And finally there's the end papers. Classic paste papers made on the cheap in the shop for the purpose of slapping some color between the covers and the numbers. Click on these images--they look like rocks and sticks in the shallow parts of a river. I have no doubt whoever had the inspiration to make these end papers would also be inclined to snap the ends off a few ferns before they sprinkled their edges. It goes without saying they'd use a beautiful wool plaid on their end bands. While I'm Hoovering spore out of this gorgeous chimera I'm thinking about the lucky clerk who got to open this book every day, in fact multiple times a day, and put his pen to paper. It's the same hand throughout, and the records within go on for a year and a half. They had to notice these details, too. And actually, the front and rear fly leaves--that includes the paste papers--are torn out. This is absolutely what I aspire to do in my stationery work. I want it to be very useful, very durable and to provide some delight to the one who has to use it every day.